etbe is currently certified at Master level. I do general Linux programming and sys-admin work. 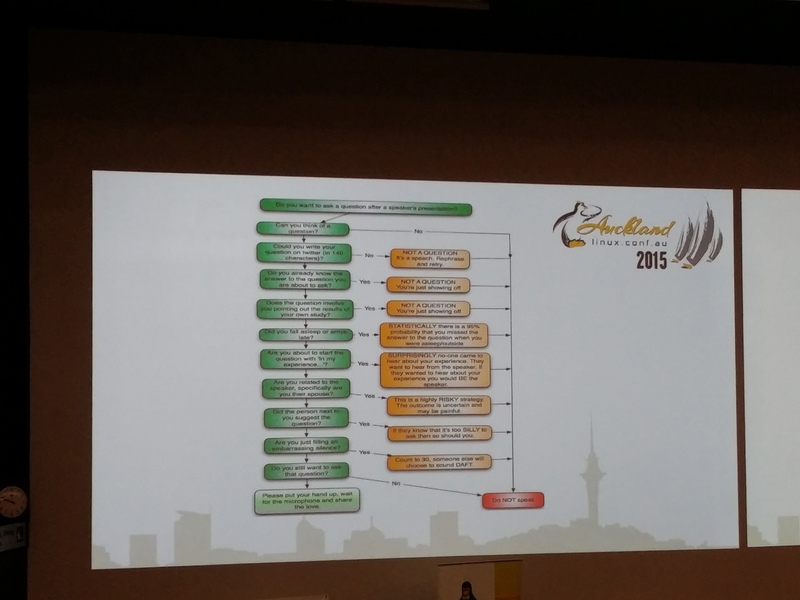 I am mostly known for my work on NSA Security Enhanced Linux. Compatibility/interoperability is a good thing. It’s generally good for systems on the Internet to be capable of communicating with as many systems as possible. Unfortunately it’s not always possible as new features sometimes break compatibility with older systems. Sometimes you have systems that are simply broken, for example all the systems with firewalls that block ICMP so that connections hang when the packet size gets too big. Sometimes to take advantage of new features you have to potentially trigger issues with broken systems. I recently added support for IPv6 to the Linux Users of Victoria server. I think that adding IPv6 support is a good thing due to the lack of IPv4 addresses even though there are hardly any systems that are unable to access IPv4. One of the benefits of this for club members is that it’s a platform they can use for testing IPv6 connectivity with a friendly sysadmin to help them diagnose problems. I recently notified a member by email that the callback that their mail server used as an anti-spam measure didn’t work with IPv6 and was causing mail to be incorrectly rejected. It’s obviously a benefit for that user to have the problem with a small local server than with something like Gmail. In spite of the fact that at least one user had problems and others potentially had problems I think it’s clear that adding IPv6 support was the correct thing to do. Ben wrote a good post about SSL security  which links to a test suite for SSL servers . I tested the LUV web site and got A-. This blog post describes how to setup PFS (Perfect Forward Secrecy) , after following it’s advice I got a score of B! From the comments on this blog post about RC4 etc  it seems that the only way to have PFS and not be vulnerable to other issues is to require TLS 1.2. So the issue is what systems can’t use TLS 1.2. The default Android browser before Android 5.0. Admittedly that browser always sucked badly and probably has lots of other security issues and there are alternate browsers. One problem is that many people who install better browsers on Android devices (such as Chrome) will still have their OS configured to use the default browser for URLs opened by other programs (EG email and IM). Chrome versions before 30 didn’t support it. But version 30 was released in 2013 and Google does a good job of forcing upgrades. A Debian/Wheezy system I run is now displaying warnings from the google-chrome package saying that Wheezy is too old and won’t be supported for long! Firefox before version 27 didn’t support it (the Wikipedia page is unclear about versions 27-31). 27 was released in 2014. Debian/Wheezy has version 38, Debian/Squeeze has Iceweasel 3.5.16 which doesn’t support it. I think it is reasonable to assume that anyone who’s still using Squeeze is using it for a server given it’s age and the fact that LTS is based on packages related to being a server. IE version 11 supports it and runs on Windows 7+ (all supported versions of Windows). IE 10 doesn’t support it and runs on Windows 7 and Windows 8. Are the free upgrades from Windows 7 to Windows 10 going to solve this problem? Do we want to support Windows 7 systems that haven’t been upgraded to the latest IE? Do we want to support versions of Windows that MS doesn’t support? Windows mobile doesn’t have enough users to care about. Opera supports it from version 17. This is noteworthy because Opera used to be good for devices running older versions of Android that aren’t supported by Chrome. Safari supported it from iOS version 5, I think that’s a solved problem given the way Apple makes it easy for users to upgrade and strongly encourages them to do so. For many servers the correct thing to do before even discussing the issue is to look at the logs and see how many people use the various browsers. One problem with that approach on a Linux community site is that the people who visit the site most often will be more likely to use recent Linux browsers but older Windows systems will be more common among people visiting the site for the first time. Another issue is that there isn’t an easy way of determining who is a serious user, unlike for example a shopping site where one could search for log entries about sales. I did a quick search of the Apache logs and found many entries about browsers that purport to be IE6 and other versions of IE before 11. But most of those log entries were from other countries, while some people from other countries visit the club web site it’s not very common. Most access from outside Australia would be from bots, and the bots probably fake their user agent. Is breaking support for Debian/Squeeze, the built in Android browser on Android <5.0, and Windows 7 and 8 systems that haven’t upgraded IE as a web browsing platform a reasonable trade-off for implementing the best SSL security features? For the LUV server as a stand-alone issue the answer would be no as the only really secret data there is accessed via ssh. For a general web infrastructure issue it seems that the answer might be yes. I think that it benefits the community to allow members to test against server configurations that will become more popular in the future. After implementing changes in the server I can advise club members (and general community members) about how to configure their servers for similar results. Does this outweigh the problems caused by some potential users of ancient systems? I’m blogging about this because I think that the issues of configuration of community servers have a greater scope than my local LUG. I welcome comments about these issues, as well as about the SSL compatibility issues. Here are some basic things to do when debugging storage performance problems on Linux. It’s deliberately not an advanced guide, I might write about more advanced things in a later post. When a hard drive is failing it often has to read sectors several times to get the right data, this can dramatically reduce performance. As most hard drives aren’t monitored properly (email or SMS alerts on errors) it’s quite common for the first notification about an impending failure to be user complaints about performance. View your kernel message log with the dmesg command and look in /var/log/kern.log (or wherever your system is configured to store kernel logs) for messages about disk read errors, bus resetting, and anything else unusual related to the drives. If you use an advanced filesystem like BTRFS or ZFS there are system commands to get filesystem information about errors. For BTRFS you can run “btrfs device stats MOUNTPOINT” and for ZFS you can run “zpool status“. Most performance problems aren’t caused by failing drives, but it’s a good idea to eliminate that possibility before you continue your investigation. One other thing to look out for is a RAID array where one disk is noticeably slower than the others. For example if you have a RAID-5 or RAID-6 array every drive should have almost the same number of reads and writes, if one disk in the array is at 99% performance capacity and the other disks are at 5% then it’s an indication of a failing disk. This can happen even if SMART etc don’t report errors. The iostat program in the Debian sysstat package tells you how much IO is going to each disk. If you have physical hard drives sda, sdb, and sdc you could run the command “iostat -x 10 sda sdb sdc” to tell you how much IO is going to each disk over 10 second periods. You can choose various durations but I find that 10 seconds is long enough to give results that are useful. By default iostat will give stats on all block devices including LVM volumes, but that usually gives too much data to analyse easily. The most useful things that iostat tells you are the %util (the percentage utilisation – anything over 90% is a serious problem), the reads per second “r/s“, and the writes per second “w/s“. The parameters to iostat for block devices can be hard drives, partitions, LVM volumes, encrypted devices, or any other type of block device. After you have discovered which block devices are nearing their maximum load you can discover which of the partitions, RAID arrays, or swap devices on that disk are causing the load in question. The iotop program in Debian (package iotop) gives a display that’s similar to that of top but for disk io. It generally isn’t essential (you can run “ps ax|grep D” to get most of that information), but it is handy. It will tell you which programs are causing IO on a busy filesystem. This can be good when you have a busy system and don’t know why. It isn’t very useful if you have a system that is used for one task, EG a database server that is known to be busy doing database stuff. It’s generally a good idea to have sysstat and iotop installed on all systems. If a system is experiencing severe performance problems you might not want to wait for new packages to be installed. In Debian the sysstat package includes the sar utility which can give historical information on system load. One benefit of using sar for diagnosing performance problems is that it shows you the time of day that has the most load which is the easiest time to diagnose performance problems. Swap use sometimes confuses people. In many cases swap use decreases overall disk use, this is the design of the Linux paging algorithms. So if you have a server that accesses a lot of data it might swap out some unused programs to make more space for cache. When you have multiple virtual machines on one system sharing the same disks it can be difficult to determine the best allocation for RAM. If one VM has some applications allocating a lot of RAM but not using it much then it might be best to give it less RAM and force those applications into swap so that another VM can cache all the data it accesses a lot. The important thing is not the amount of swap that is allocated but the amount of IO that goes to the swap partition. Any significant amount of disk IO going to a swap device is a serious problem that can be solved by adding more RAM. The ratio of reads to writes depends on the applications and the amount of RAM. Some applications can have most of their reads satisfied from cache. For example an ideal configuration of a mail server will have writes significantly outnumber reads (I’ve seen ratios of 5:1 for writes to reads on real mail servers). Ideally a mail server will cache all new mail for at least an hour and as the most prolific users check their mail more frequently than that most mail will be downloaded before it leaves the cache. If you have a mail server with reads outnumbering writes then it needs more RAM. RAM is cheap nowadays so if you don’t want to compete with Gmail it should be cheap to buy enough RAM to cache all recent mail. The ratio of reads to writes is important because it’s one way of quickly determining if you have enough RAM and adding RAM is often the cheapest way of improving performance. One common performance problem on systems with multiple disks is having more load going to some disks than to others. This might not be a problem (EG having cron jobs run on disks that are under heavy load while the web server accesses data from lightly loaded disks). But you need to consider whether it’s desirable to have some disks under more load than others. The simplest solution to this problem is to just have a single RAID array for all data storage. This is also the solution that gives you the maximum available disk space if you use RAID-5 or RAID-6. A more complex option is to use some SSDs for things that require performance and disks for things that don’t. This can be done with the ZIL and L2ARC features of ZFS or by just creating a filesystem on SSD for the data that is most frequently accessed. I’m sure that I missed something, please let me know of any other basic things to do – or suggestions for a post on more advanced things. The above sign was at the Melbourne Docks in December 2014 when I was returning from a cruise. 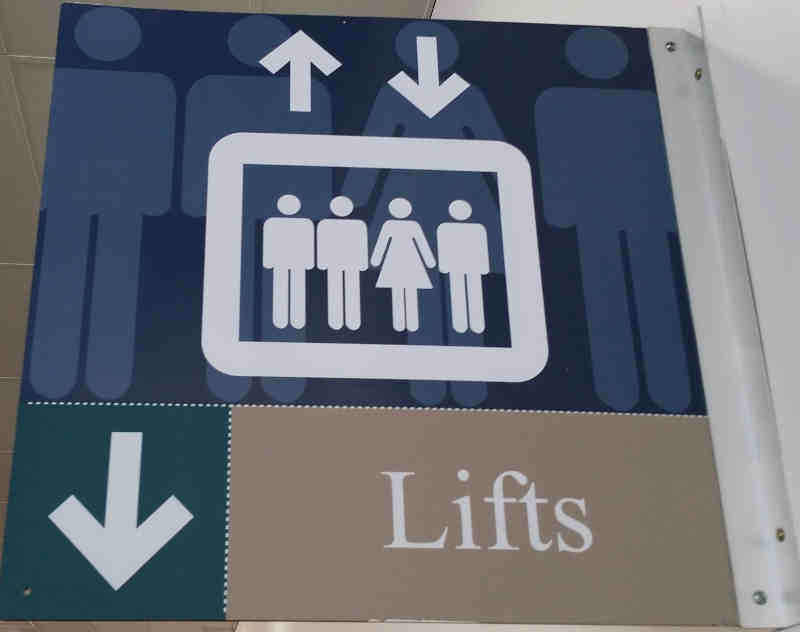 I have no idea why there are 3 men and 1 woman on the sign (and a dock worker was also surprised when I explained why I was photographing it). 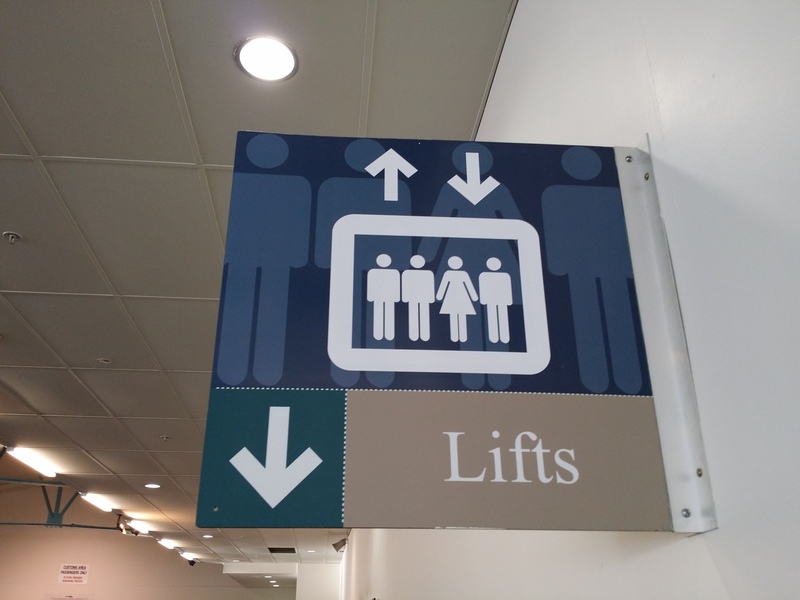 I wonder whether a sign that had 3 women and 1 man would ever have been installed or not noticed if it was installed. 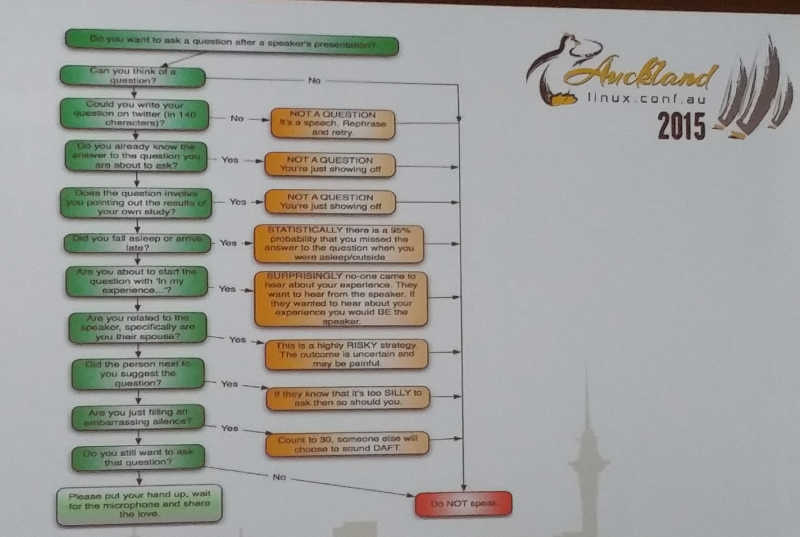 At the start of the first day of LCA 2015 the above was displayed at the keynote as a flow-chart for whether someone should ask a question at a lecture. Given that the first real item in the list is that a question should fit in a tweet I think it was inspired by my blog post about the length of conference questions . 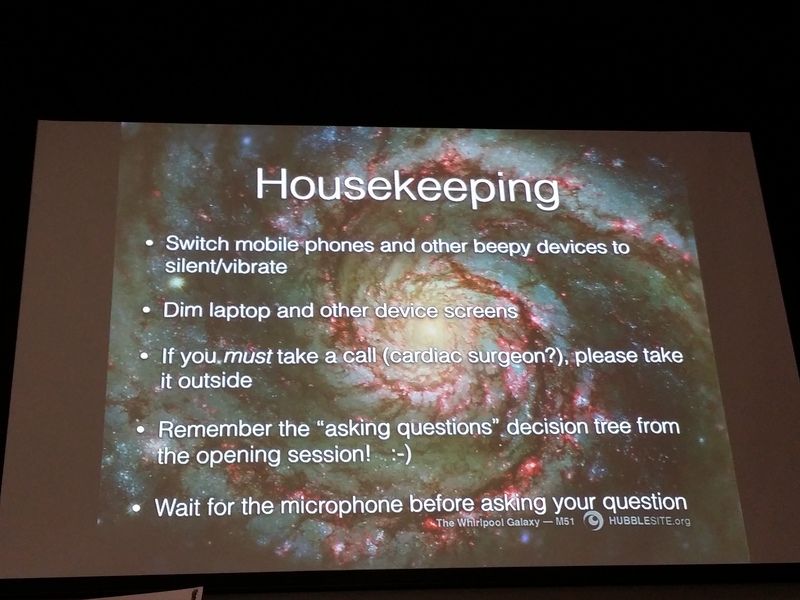 At the introduction to the Astronomy Miniconf the above slide was displayed. 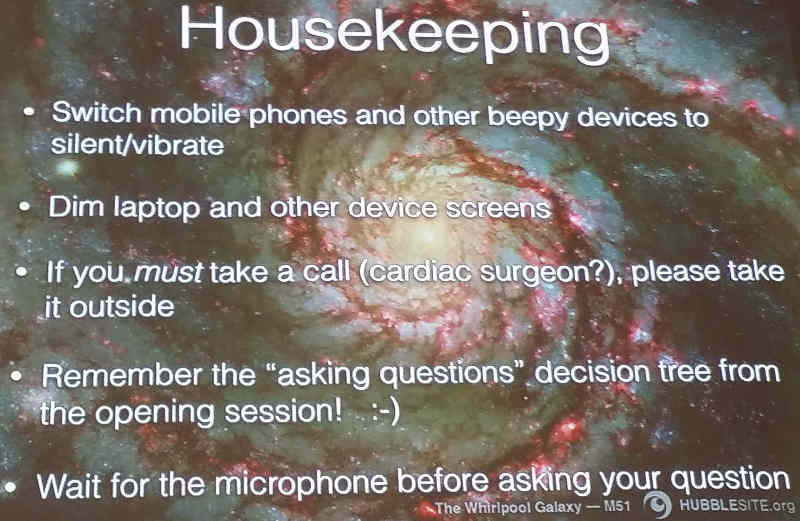 In addition to referencing the flow-chart for asking questions it recommends dimming laptop screens (among other things). 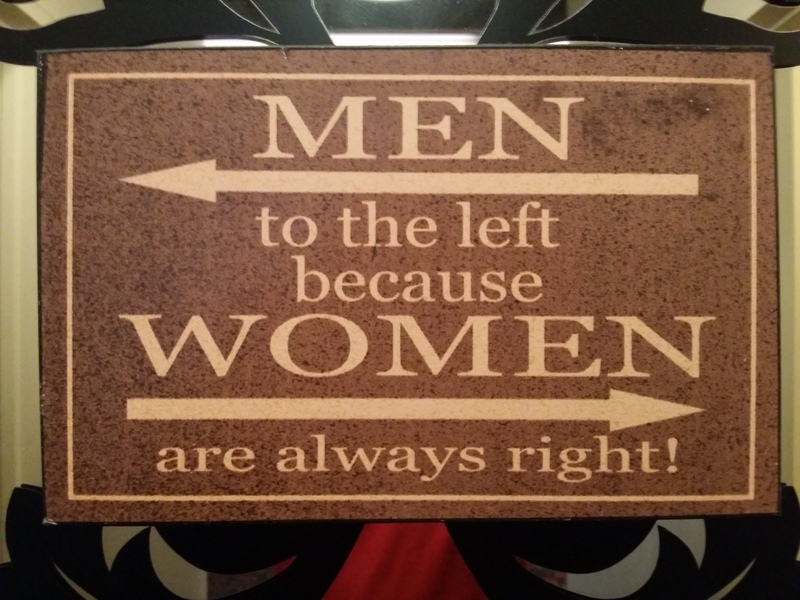 The above sign was at a restaurant in Auckland in January 2015. 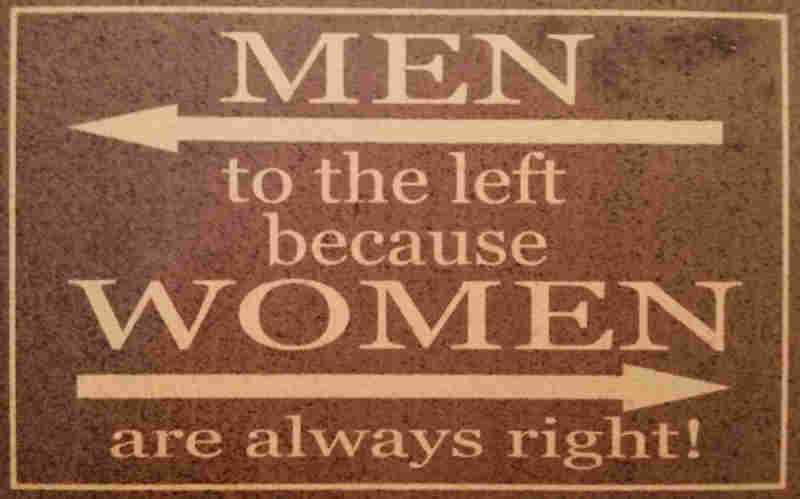 I thought that sort of sexist “joke” went out of fashion a few decades ago. The above photo is from a Melbourne department store in February 2015. 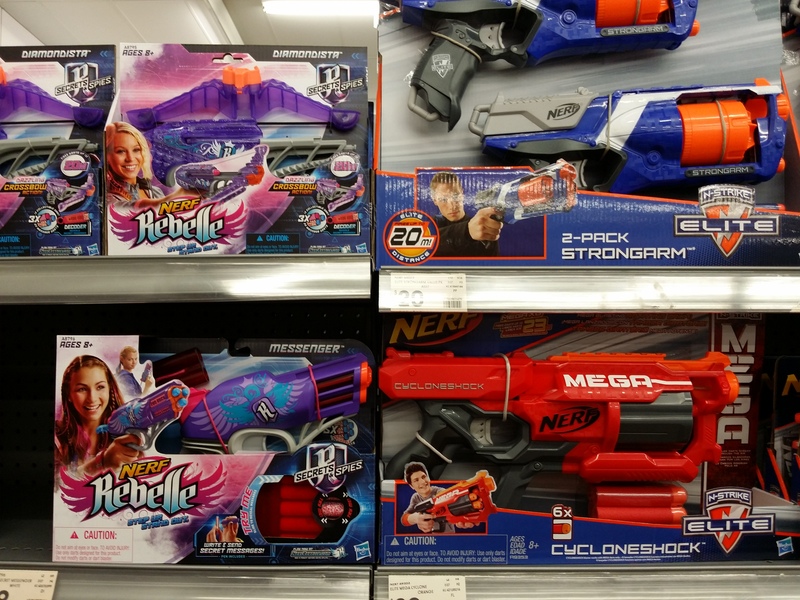 Why gender a nerf gun? That just doesn’t make sense. Also it appeared that the only nerf crossbow was the purple/pink one, is a crossbow considered feminine nowadays? 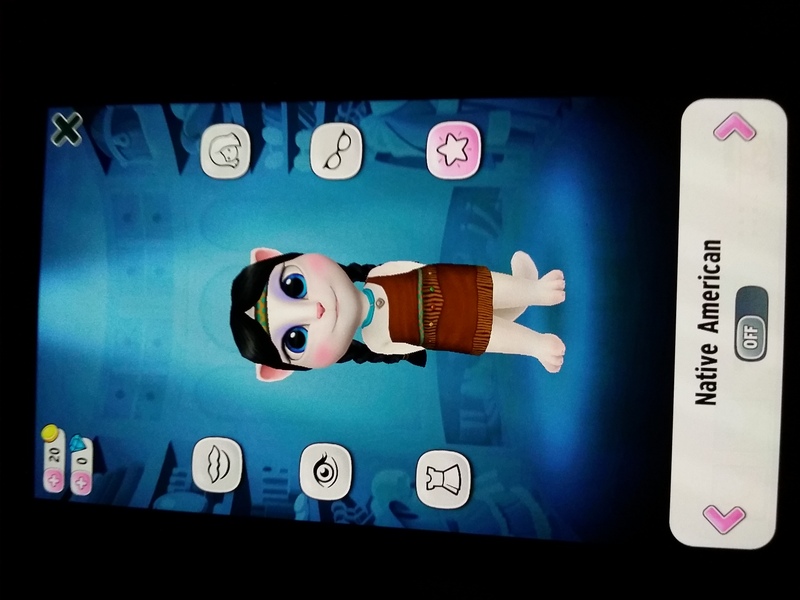 The above picture is a screen-shot of one of the “Talking Angela” series of Android games from March. Appropriating the traditional clothing of marginalised groups is a bad thing. 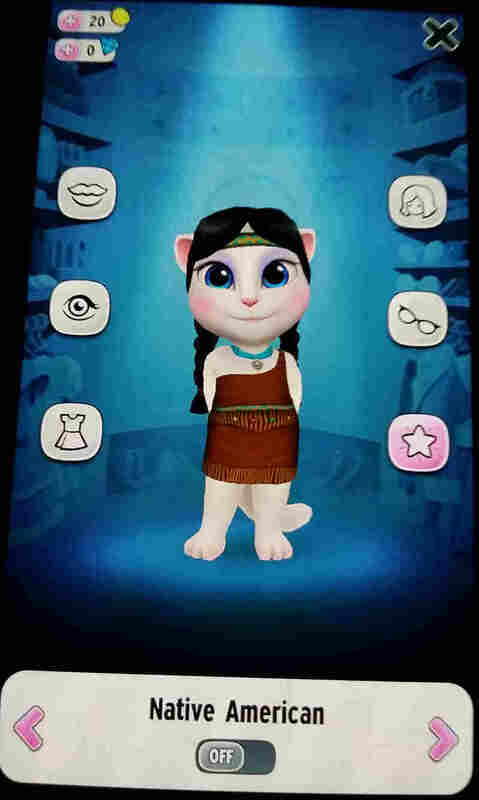 People of Native American heritage who want to wear their traditional clothing face discrimination when they do so, when white people play dress-up in clothing that is a parody of Native American style it’s really offensive. The site Racialicious.com has a tag for articles about appropriation . 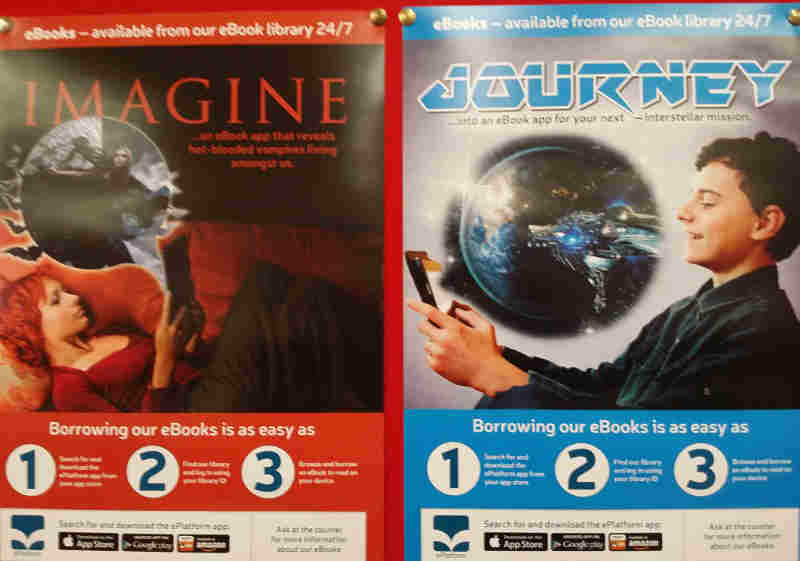 The above was in a library advertising an Ebook reader. In this case they didn’t even have pointlessly gendered products they just had pointlessly gendered adverts for the same product. They also perpetuate the myth that only girls read vampire books and only boys read about space. 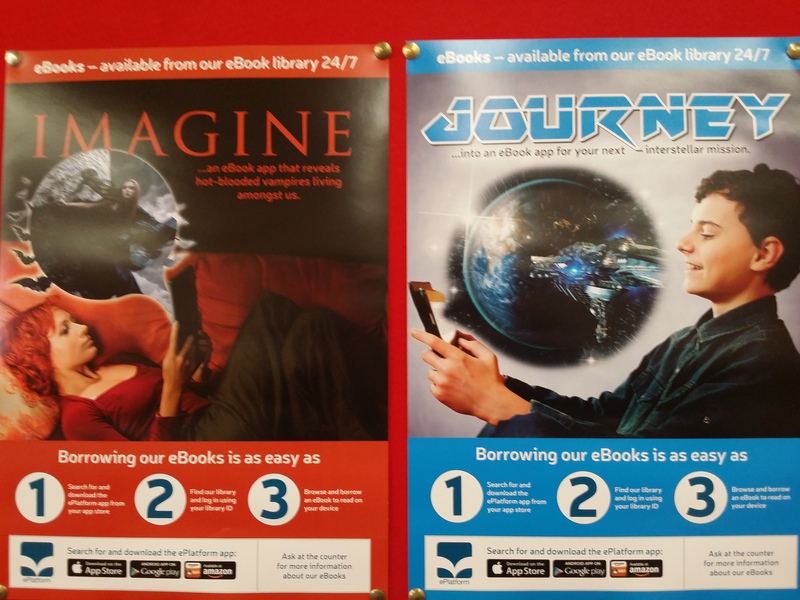 Also why is the girl lying down to read while the boy is sitting up? 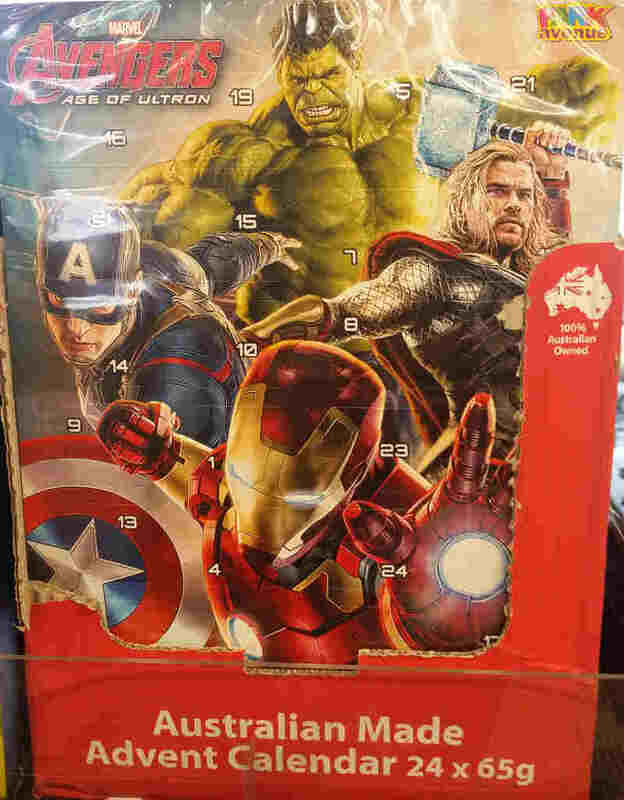 Above is an Advent calendar on sale in a petrol station. Having end of year holiday presents that have nothing to do with religious festivals makes sense. 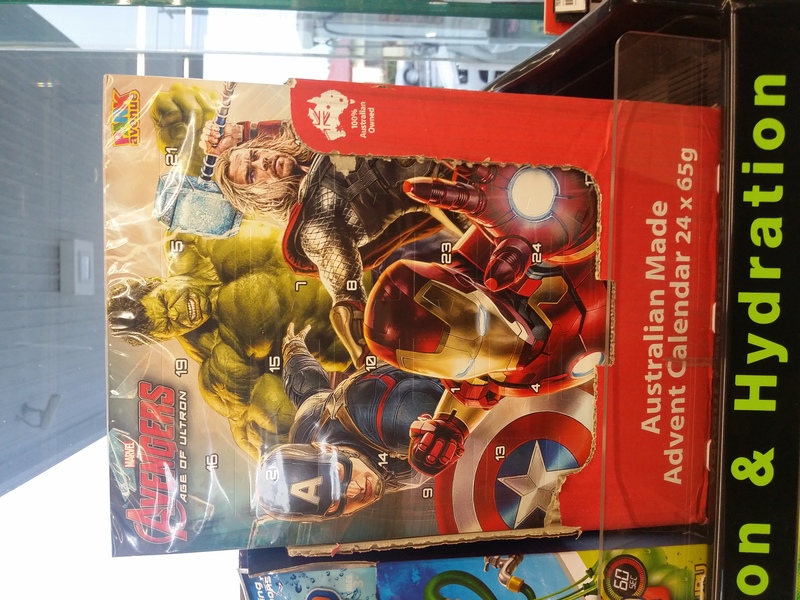 But Advent is a religious observance. I think this would be a better candidate for “war on Christmas” paranoia than a coffee cup of the wrong colour. The above photo is of boys and girls pipette suckers. 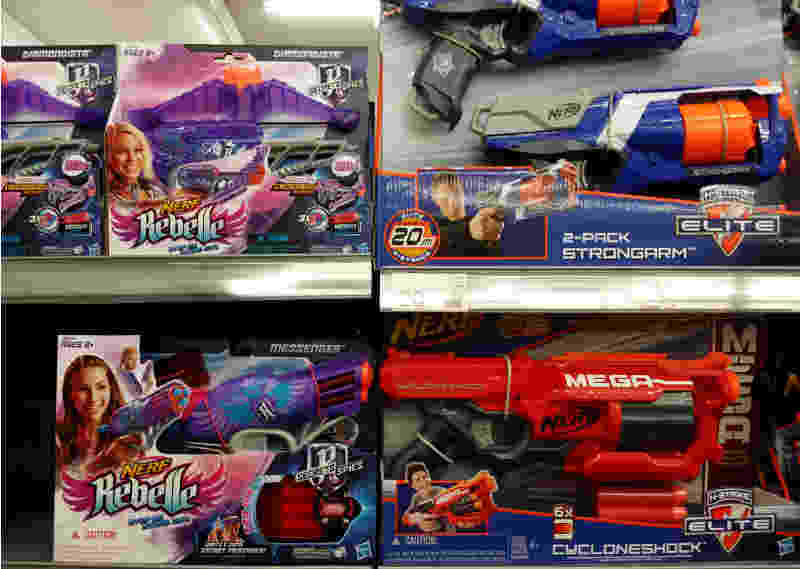 Pointlessly gendered recreational products like Nerf guns is one thing, but I think that doing it to scientific equipment is a bigger problem. 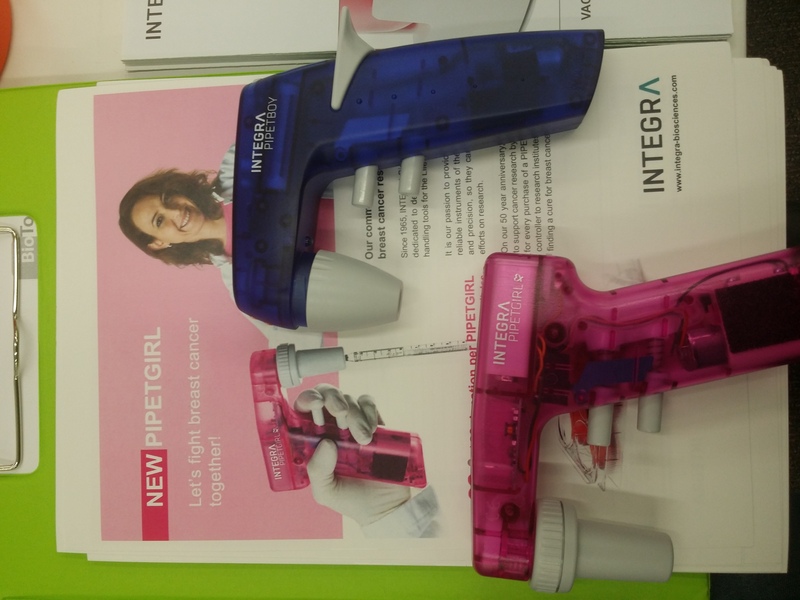 Are scientists going to stop work if they can’t find a pipette sucker of the desired gender? Is worrying about this going to distract them from their research (really bad if working with infectious or carcinogenic solutions). 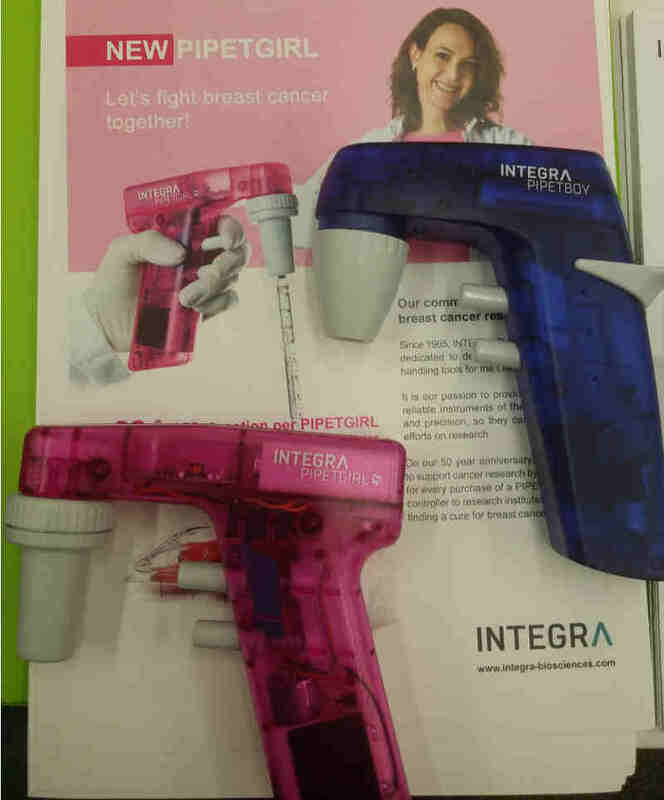 The Integra advertising claims to be doing this to promote breast cancer research which is also bogus. Here is a Sociological Images article about the problems of using pink to market breast cancer research  and the Sociological Images post about pinkwashing (boobies against breast cancer) is also worth reading . As an aside I made a mistake in putting a pipette sucker over the woman’s chest in that picture. The way that Integra portreyed her chest is relevant to analysis of this advert. But unfortunately I didn’t photograph that. Here is a link to my sociological images post from 2014 .